TONY BLAIR has at last gone – four years later than he should have and amid staged scenes in Parliament more reminiscent of a Hollywood musical than a political process. In the run up, press and television have deluged us with acres of newsprint and screen time “analysing” his decade in power. They have all spoken with one voice, trying to convince us that Blair, “for all his faults”, was an honest and earnest man, inspired by religious zeal who genuinely wanted to make the world a better place. The behind-the-scenes spin doctors have been earning their bread. Blair was an arrogant, ignorant man who, with his mate George Bush, rushed in where wiser politicians feared to tread – and caused the deaths and injuries of uncounted thousands of Iraqis and Afghans, not to mention hundreds of British service personnel. The invasion of Iraq was done in an attempt to secure American imperialist control over Iraq’s vast oil supplies and to create a permanent US military presence in the region. Blair proved he was happy to lie and break international laws to achieve his selfish ends. And his successor Gordon Brown – for all his “let the changes begin” rhetoric – looks like taking us further along the same path. Brown is far more intelligent, cautious and less obsessed with his personal image than Blair and could therefore be a lot more dangerous. His political allegiance is clearly with global capitalism. Brown has spoken of sweeping changes in both the Labour Party and in the structure of government. Already he is dividing the Department of Education in two and restructuring the Department of Trade and Industry. He has also spoken of decreasing the power of the trade unions within the Labour Party. This could fundamentally change the nature of the Labour Party and effectively destroy it as the political voice of organised labour in Britain. Brown has already appointed Damon Buffini – the private equity chief – to a new “Business Council for Britain” that will advise the Government on all policies affecting business. It will also advance the direct control of the private sector over many aspects of Government that are currently the responsibility of elected – and therefore directly accountable – people. Brown calls this “de-politicising” various functions of Government. He says he wants to get away from “tribal politics” and began last week with ill-fated approaches to Liberal Democrat leader Menzies Campbell and Paddy Ashdown. They rebuffed him but the move outraged many rank-and-file Labour activists. “How can we now go round on the doorsteps telling people to vote Labour and not Liberal Democrat if they end up with Lib Dems in Government whichever way they vote?” two activists told the New Worker. Gordon’s approach to the Lib Dems, without first consulting any of his Labour colleagues, shows his utter contempt for the Labour Party. He has acquired Harriet Harman as a deputy leader of the Labour Party. Her first act was to backtrack on the very sentiment that had won her critical support – a willingness to admit that, with hindsight, the invasion of Iraq had been a mistake and that the Government should apologise for it. Nevertheless there is an opportunity in Blair’s departure for the trade unions to raise the pressure from some real changes of policy and direction. Labour’s standing in the polls has risen slightly – more as a result of Blair going than Brown coming – and that has given rise to speculation that Brown may call a snap general election. This has risen after the defection of Tory MP Quentin Davies to the Labour Party. An early election would be a risky strategy and Brown would have to produce a few spoonfuls of honey for the electorate. No doubt he has plenty stashed away. And sticking to the two per cent cap on public sector pay would be no way to win voters. There is a chance now to pressure Brown into some beneficial changes. TONY BLAIR’S last act as Prime Minister has been to attend the European summit in Brussels, to work out a deal on what is being called an “amending treaty” but which many regard as a thinly veiled constitution. And he seems to have made a total dog’s breakfast of it, from any point of view. He claims he has negotiated a cast-iron opt out on the Charter of Fundamental Rights that, he says, Britain does not want to be governed by Europe on. He says he has “defended the most important red lines” and has secured a legally binding protocol on the Charter that would prevent the European Court of Justice applying it to Britain. These Charter rights include: article three, which bans eugenic practices; article four, which bans torture; article five, which bans human trafficking; article eight, which protects personal data; article 12, which defends the right of assembly; article 15, which covers working rights; article 19, which forbids deportation if there is a risk of torture; article 28, which defends the right to take industrial action; article 32, which bans child exploitation and article 35 which gives the right to preventative healthcare. The rest of Europe will be covered by these articles but we in Britain will not. But there is some hope – lawyers claim that the protocol is not quite so legally binding as Blair says it is. This will be one for trade union lawyers to test. On the other hand Blair has signed the main “amended treaty” deal, which includes a clause inserted at the last minute by Italy, which says: “The Union shall establish an economic and monetary union whose currency is the euro”. It is not clear whether he agreed this out of ignorance or just to spite Gordon Brown, who has toiled so hard over the last 10 years to keep Britain out of the single currency. Blair pointedly did not take his Foreign Secretary, Margaret Beckett, along, who might have been able to point out that this clause did indeed undermine Westminster’s sovereignty over Britain’s economic policy and hand some powers to Brussels. On one issue Brown, who was in Manchester attending his own coronation as Blair’s successor, had to order Blair to go back into the conference chamber to renegotiate. French leader Nicolas Sarkozy had sparked a big row by diluting the EU’s commitment to “free and undistorted competition” – the ultra-capitalists’ mantra, in whose name they sacrifice jobs, lives and the very planet we live on to the great god profit. Brown phoned Blair three times, so horrified was he by Sarkozy’s heresy, and ordered Blair to table a protocol to guarantee the EU’s powers to regulate cartels and anti-trust issues were not damaged. Blair has told MPs that the “concept of a constitutional treaty” has been abandoned in favour of a “conventional amending treaty”. But Hans-Gert Poetering, president of the European Parliament, has told the Council of Europe in Strasbourg that while the proposed anthem and flag have been dropped, “The substance of the constitution has been retained”. This is the constitution that, a couple of years ago, Blair promised he would put before the British people in a referendum. This promise put other European governments on the spot; their people also demanded a referendum and the constitution died after the people of France and the Netherlands voted against it – much to the delight of Blair’s best friend George Bush. Blair answered this claiming that “everyone’s bored with talking about institutional arrangements”. 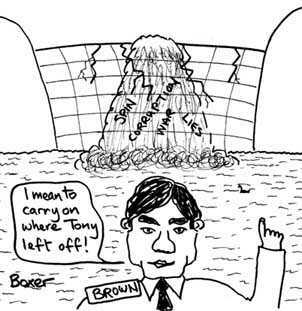 Brown says he is for a referendum – we must put pressure to hold him to that. At one point Blair was boasting about Britain being “at the heart of Europe where we belong” and “playing a leading role in Europe”. But Britain was not involved at any stage in the pre-Council negotiations on this “amending treaty”, while all other countries in Europe had been. Blair is spinning so much he has lost track of where he is standing on Europe. His only clear aim now seems to be to make life for Brown as difficult as possible.